My latest file-searching find, if you’ll pardon the pun, is Find Any File (Mac App Store link). If Tembo is a throwback to the search-results interface of Tiger (Mac OS X 10.4), Find Any File will remind many users of the Find interface of the “classic” Mac OS. Below the location pop-up is where you enter your search criteria. By default, you get a single search option, set to Name Contains yoursearchterm. But you can modify this item, and you can add as many additional search criteria as you like by clicking More Choices. Your options for searching include name, modification date, creation date, size, item type (is or is not a folder, is or is not an alias), file-type code, and creator code. Unlike Tembo, Find Any File doesn’t use OS X’s Spotlight indexes for searching; rather, it uses the file system’s search features. The advantage to this approach is that Find Any File can be faster than Spotlight for finding some files, and Find Any File can find files Spotlight doesn’t index—more on that in a moment. The downside is that Find Any File doesn’t search the contents of files. Click Find, and in a few seconds Find Any File presents its results window. The default window displays a simple list of found items along with each item’s kind, modification date, and (for files) size. Select an item and you can view, at the bottom of the window, the folder hierarchy leading to the selected item. But the more useful listing, in my opinion, is hierarchical (Tree) view. Switch to this view, and Find Any File lists each file within its folder hierarchy, letting you see, at a glance, where each found file resides. In either view, you can select an item and press Spacebar to view a Quick Look preview of the item; you can also open the item, reveal it in the Finder, get info on it, or delete it (by either moving it to the Trash or deleting it immediately). The full path to the selected file appears at the bottom of the window; right-click (or Control-click) the path to copy it—in Unix or Mac format—to the Clipboard. If you enable Tooltips (View -> Show Tooltips), hovering your cursor over an item displays additional information, including creating date, file ownership and permissions, and type and creator codes. 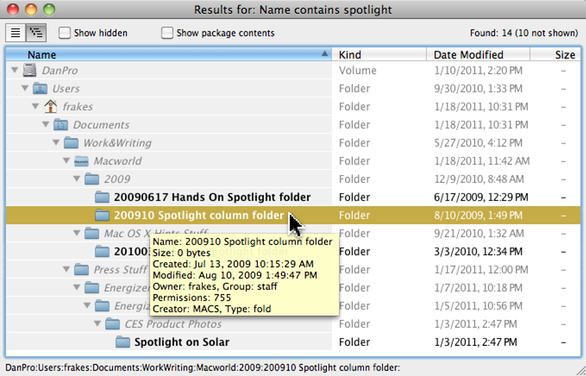 Both views also provide options to show hidden files and to show package contents (the latter, when enabled, displays items found inside Mac OS X packages). A nice touch here is that Find Any File explicitly tells you how many hidden items were found: In the top-right corner of the results window is a count of items in the results window; if you see # not shown, you’ll need to enable one or both of the Show options to see everything. One glitch I did experience is that if you choose a specific folder to search, and you later want to search a different folder, there’s no obvious way to choose another custom search location. The trick is to first switch the location to one of the stock locations and then switch back to the custom-folder item, which will bring up the dialog to choose a new folder. But here’s a tip: You can just drag the desired search folder onto the location pop-up menu. The biggest drawback of Find Any File is, of course, that it doesn’t search inside files. If you want to avoid Spotlight, the free EasyFind can search contents and provides a few additional options compared to Find Any File—although I much prefer Find Any File’s search-results display. I keep both utilities on hand, and I use them both regularly.